In this circuit, the meter CPU receives auto dimmer signals from the main body ECU (driver side junction block assembly) using the CAN communication system (CAN No. 1 Bus). When the meter CPU receives an auto dimmer signal, it dims the meter illumination (warning and indicator lights). The main body ECU (driver side junction block assembly) determines whether it is daytime, twilight, or nighttime based on the waveform transmitted from the automatic light control sensor. If the main body ECU (driver side junction block assembly) determines that it is nighttime and the light control switch is in the tail, head, or AUTO, the ECU sends an auto dimmer signal. According to the signal, the combination meter assembly dims the meter illumination. When the meter illumination does not dim at night, there may be a malfunction in the automatic light control sensor, main body ECU (driver side junction block assembly), CAN communication system, harness or connector, or combination meter assembly. The automatic light control sensor sensitiveness can be customized (See page ). When the meter illumination setting is 8, the meter illumination does not dim even though the light control switch is tail, head, or AUTO position at night. Therefore, check the meter illumination setting before proceeding to the following steps. (b) Turn the light control switch to the tail, head, or AUTO position. (c) Cover the light control switch. (d) Check the accessory meter assembly illumination. Accessory meter assembly illumination does not operate normally. Accessory meter assembly illumination operates normally. The accessory meter assembly illumination dims according to the dimmer signal as the combination meter assembly does. Therefore, when only the meter illumination does not dim at night, replace the combination meter assembly. (b) Turn the light control switch to the AUTO position. (c) Cover the automatic light control sensor. (d) Check that the taillights and low beam headlights. The taillights and low beam headlights come on. (e) Uncover the automatic light control sensor. (f) Check that the low beam headlights and taillights. The low beam headlights and taillights go off. Automatic light control system operates normally. Automatic light control system does not operate normally. (a) Replace the main body ECU (driver side junction block assembly) with a new or a known good one (See page ). The operation of the combination meter assembly returns to normal. The meter CPU controls the meter illumination based on an auto dimmer signal from the main body ECU (driver side junction block assembly). If the meter does not dim when the light control switch is in the tail, head, or AUTO position at night, it may be for either of 2 reasons. 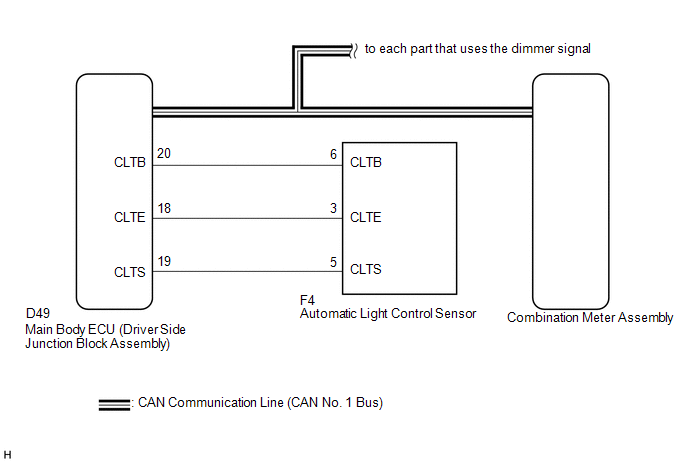 The first reason is that the main body ECU (driver side junction block assembly) does not send an auto dimmer signal. The second is that the meter CPU does not dim the meter illumination even though the meter CPU receives an auto dimmer signal.